We’re all excitedly waiting for the end of March so that we can get our hands on Nintendo’s new console, The Nintendo 3DS. Few of us have been lucky enough to get a glimpse of it yet, let alone a hands on experience. That very chance came for those of us in Melbourne Australia just last night. Club Nintendo Members and friends were invited to be amongst the first in the country to experience the 3D-without-glasses gaming phenomenon. Amongst the crowds, Zelda Informer forum member Rae and myself were there to get our hands on these amazing things known as the Nintendo 3DS. What was it like? How were the games? Well my friends; read on for what we experienced and our thoughts on the night, because it’s fantastic to finally be able to give you Zelda Informer viewers our own exclusive 3DS experience, instead of just telling you everything we’ve heard. It’s all exclusive and first-hand this time folks. We arrived just shy of an hour early, where we were presented with our numbered Nintendo 3DS lanyards. They made for a nice keepsake, although the number tags had to be returned for some oddly disappointing reason. We thought we were there nice and early, but the really keen fans had been there for a good three hours before it even started. Being 150th and 151st in a line of over 400 people, meant that it was just short of two hours of queuing before we got to the 3DSs, but the wait wasn’t eventless. Some kid got so excited that the last meal he had, whatever it was, ended up splattered all over the pavement. That’s one way to clear a crowd I can tell you. We were just glad he was behind us. Barfing adolescents aside, the time waiting passed quickly with the pre-show entertainment – some 3DSs roaming around the crowds. Well, they’re not quite that impressive; it was the people they were attached to that were doing the roaming. If you’re a short person that knows what it’s like to squeeze through crowds to get a closer glimpse at something, then you can sympathise with us. These 3DSs were playing short demo trailers of some of the major titles. My first glimpses constituted of Mario Kart, Nintendogs + Cats and The Legend of Zelda: Ocarina of Time. 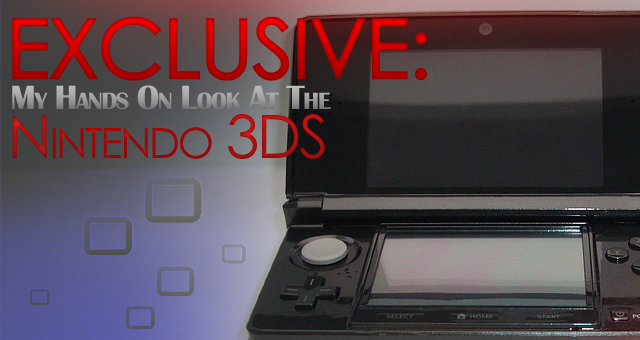 One thing with the 3DS, as many of us are already aware, is that it is something you must experience individually. Looking over shoulders and through crowds doesn’t get you a great view for the 3D. Due to the way it works, with the two different pictures, side on views lead to blurry, distorted and confusing images. Thankfully we managed to get close up and view them the way they’re intended to be. With the 3DS right there in front of me, all I can say is that it is truly amazing. With the slider set at 2D you get superb graphic quality, but then as you increase the 3D effect you can watch that picture merge into a fully 3D environment. Seeing Links little head merge from 2D to a fully spherical 3D graphic is impressive. No matter how many times you read about how it all works, it is still amazing to witness. And to think, in just six weeks this experience is ours, in our own hands. After two hours, we were at long last in the preview room. There were at least 25 consoles, and with only 20 people in there at a time, there was no missing out for anyone. I was silently hoping that one of the Nintendo staff that the consoles were attached to would happen to blurt out “who wants to come play with me?”, or in the spirit of some quotes from Spirit Tracks, “come tap me with your stylus”. Pubescent teenage boy musings aside, it was finally time to play some 3DS. Let me say, that if the original DS is a brick and the subsequent DS Lite and DSi releases are improvements to the console designs, then the 3DS is that design perfected. The consoles have a shiny and crisp look that we’ve all seen plenty of pictures of by now. The screen’s clarity and overall quality is far superior to that of the DS. Yes, we’ve all heard that said, but now, I’ve seen it. I can confirm that it is true. This console doesn’t look too fragile either, and while I don’t suggest trying to find out, I think they could withstand some pretty hard falls. Finally on the console itself, I must mention how it fits into your hands. Call it the DS series’ equivalent of the Gamecube controller. It fits into your hands just perfectly and comfortably. By now we had cast aside our inkling of fear that one of us would be amongst the few people who can’t see the 3D effect. We could see it fine and it sure was fine to see. I began with a trial of Augmented Reality (AR Games), a game that comes preinstalled on the console. Sure it may not be a big title or release, but once I got the hang of it, it was the perfect way to see the 3DS’s abilities put to use. The camera is used to get a focus on your environment – which happens to be a special card that you place on the table in front of you – and once it does, the game begins. You use the gyroscope aiming feature, where you literally move the console about, to aim. The crosshair remains in the middle of the screen so it’s the console that must move. What are we aiming at you ask? Well, that’s where the augmenting begins. Your realistic environment becomes distorted into convex and concave shapes with targets looming all about. Enemies to shoot burst through your reality and it’s your job to take them down. While the game might be as simple as Paper Plane on DSi Ware, it’s one of those little games that can just eat away the hours. Unfortunately, I only had 10 minutes to see everything that I wanted to, so it was time to move on. The main thing I took away from this booth was that this is no first-step towards a future of 3D gaming. Often when a new concept like this starts off it takes a while to perfect. There are kinks and things can seem sloppy. No doubt the 3DS will become more refined and improve over time, but the 3D effect this has going right now are perfect. The way the 3DS shoves it in your face; you would think that this is age-old and established technology. The next booth was what I’d been wanting to see for well over six months: Ocarina of Time 3D. Never has aimlessly wondering around Kokiri forest and jumping into water been so enjoyable – except maybe the first time we ever did it. Perhaps it’s better for me to say that it has never looked so visually satisfying, intriguing and stunning. With the 3D off you get a picture quality similar to the Nintendo 64 in a regard, but also far superior in framerate, smoothness and clarity. 3D on, well, that’s just fantastic. Apart from lighting the occasional cob web or torch, Deku Sticks have never been that useful. However, turning Link around to face the camera and then swinging his Deku Stick towards you provides a pretty cool demonstration of the 3D effect. Indescribable really. The touch screen was fairly useless in the demo, but once you get into the game more, it looks like it will be great to access items on the fly. As foreign and new as it was, the sense of familiarity that Ocarina brought really helped to show what new aspects the 3DS brings to this remake. Firing Deku Seeds from my slingshot at Mido has never been more fun either. The slingshot can be aimed with the gyroscope, so you’re literally moving the 3DS around to aim with the world moving around like it really was there on the other side of the 3DS. Don’t be daunted though, because the choice for the classic aiming style is still there. On that note, the thumb-pad is everything we’ve been told. Your thumb rests in it comfortably and you just slide it in the direction you want to go, with full 360 degree motion. It’s not really a stick, hence why it is called the slider. It’s a little pad that slides around, and puts a lot less pressure on your thumb. In other words, it is something that can be used for a lot longer than a control stick, and is something I hope to see on future home console controllers. After Ocarina I moved on to the other must see on my list – Kid Icarus: Uprising. A few minutes is enough to get a feel for the fast paced and constant action that this game is all about. With my left hand holding the console, my thumb controlled Pit on the slider and my index finger used the L-trigger to fire and attack. My right hand took a hold of the stylus which was used on the touch screen (where else?) to aim the crosshair that appears on the top screen. All the while Pit was sprinting forwards, firing and attacking the enemies flying towards him from the distance. This is set to be what looks like a fast-paced action game that’s probably best played in short bursts with the energy it requires. Of course, I couldn’t resist playing around with the 3D slider here as well. The 2D graphics are stunning once again, but what you get with Kid Icarus that the other games didn’t offer is a real sense of depth. As you slide on that 3D, the buildings extend off into the distance in a jaw-dropping, eye-brow raising fashion – literally. Most 3D effects are about having things come out at you, but with Kid Icarus the depth into the game is what was special. Enemies coming towards you from a far was… well, what can I say that I haven’t already- fascinating, awe-inspiring, phenomenal. You get the idea. This game looks like even more of a must buy once you’ve played it for a couple of minutes. In total there were 10 booths. I got around to three of them, but there was also demos for Pilotwings Resort, Super Street Fighter IV 3D, and Mario Kart 3D. 3D trailers were also viewable for Metal Gear Solid: Snake Eater 3D and Resident Evil: Revelations. There is one booth that I’m not sure what was in it or what we missed out on, but the final one was Nintendogs + Cats, which Rae had a closer look at. It looks like Kirby’s Epic Yarn will have some tough competition for 2011’s cutest game award. With cuddly cats and dogs running around in the background, getting closer and further away, the good ol’ days of 2D sprites simply getting bigger and smaller to create depth seems so far removed. Nintendogs + Cats was a great game as far as showing off the stock-standard 3D effect of popping out of the screen goes. Furry friends with their paws up close and personal- it’s cuter than ever and looks to be, in all ways, better than the originals. Before we had gotten anywhere near being over our giddy excitement, the ten minutes were up and it was bye-bye to the cute little aqua 3DSs, because that’s the only colour there was. It was great to be able to get a hands on experience with the 3DS before they are released internationally late next month. The downside is that now I’m more excited than ever, and I know that I’m not going to be able to go very long without one of these babies once they’re released. Time to start scraping together the AU$349 that they’re selling for out here. Then add all of these must-buy games and I’m set for a year of financial hardship. Here’s to hoping they’re well spaced out. The wait is until March 31st for me, so I may have gotten to experience it before you readers, but the US, Europe, Japan and elsewhere have a shorter wait until you can get one for yourself. What was the best thing about it you ask? Well, as I said to the chatty Nintendo staff guy who was adamant that it was his job to get everyone’s feelings on their experiences – “Nothing beats Zelda!” Be it that we’re a Zelda site or not, Ocarina of Time is still standing tall well over a decade later. Now, as for my concluding remarks, what can I say? The 3DS will not disappoint. The hype train is not a false one. This is the real deal. We’ve all seen the gameplay videos, but it’s just like the slogan says: to believe it, you just have to see it – for yourself. There’s so much that we forgot the 3DS could even do until afterwards, so we didn’t get to check out everything like the extendable stylus. In all, The Nintendo 3DS is everything that we’ve heard it is, and the cool part is that we’ve hardly heard or seen anything yet.